ORLANDO, Fla. (June 22, 2016) – Cunard Line never disappoints. Cruises-N-More has found that all the Cunard beautiful and luxurious ships capture glamour of days gone by. One way they achieve this ambiance is through luxury offerings, and latest is the option to taste some of the world’s finest wines by the glass. For wine aficionados and those who want to taste the very best the wine world has to offer, Cunard is now offering a by-the-glass feature on their flagship, the Queen Mary 2. They are able to do this by without compromising the quality of these outstanding vintages by using the new Coravin wine pouring system. This revolutionary system uses a needle to remove the desired amount of wine from a bottle without removing the cork. If you’ve ever wanted to experience some of the world’s most expensive wines, here are some you’ll be able to enjoy on the QM2, and the prices per glass. For those who prefer an alternative to top of the line Bordeaux or other wines, an extraordinary compilation of 46 vintage port wines will also be featured in QM2’s wine cellar. Each vintage was produced in a key year of Cunard’s 176-year history, as part of a specially commissioned permanent display in the vessel’s new Carinthia Lounge. The new QM2 wine features will be available after the vessel’s refit, scheduled for completion by the end of June. Cruises-N-More highly recommends Cunard cruises for luxury cruising, especially transatlantic. 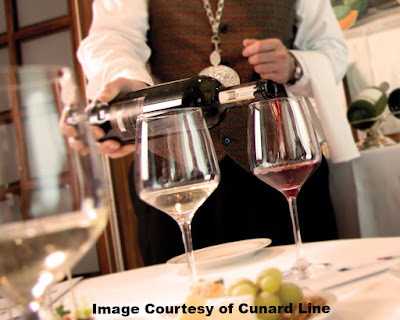 If you would like to know more about Cunard Line and Cunard’s luxury offerings, please contact owner and vice president Tiffany Neidhardt at tiffany@cruises-n-more.com or call 800-733-2048 (toll-free USA/Canada), 0-808-189-1292 (toll-free U.K.), 800-076-002 (toll-free Australia) or +1-407-771-4454. Family owned and operated with almost 20 years of dedicated service in the travel industry, Cruises-N-More offers respected expertise and superior deals, prices and amenities and consistently ranks among top producers with the major cruise lines. A member of ASTA (American Society of Travel Agents), CLIA (Cruise Line International Association) and endorsed by IATAN (International Airline Travel Agent Network), Cruises-N-More is proud to be an Ensemble Travel® Group Top Producer. The agency has received many cruise line awards, including: Princess Gold I-Excel Agency; Royal Caribbean & Celebrity Online Agency of the Year/Key Account; Carnival Top Agency & Select Agency; NCL President’s Club Agency; Holland America Centurion & Premium Preferred Agency; Disney, Silversea, Cunard & Crystal Cruises Agency Top Producer. Cruises-N-More has been featured in USA Today and Frommer’s “Cruises for Dummies” as having great cruise prices, has been ranked by MSNBC as a top Web broker and was recently featured as a great source of Caribbean travel package cruise tours on TravelVacationDream.com.